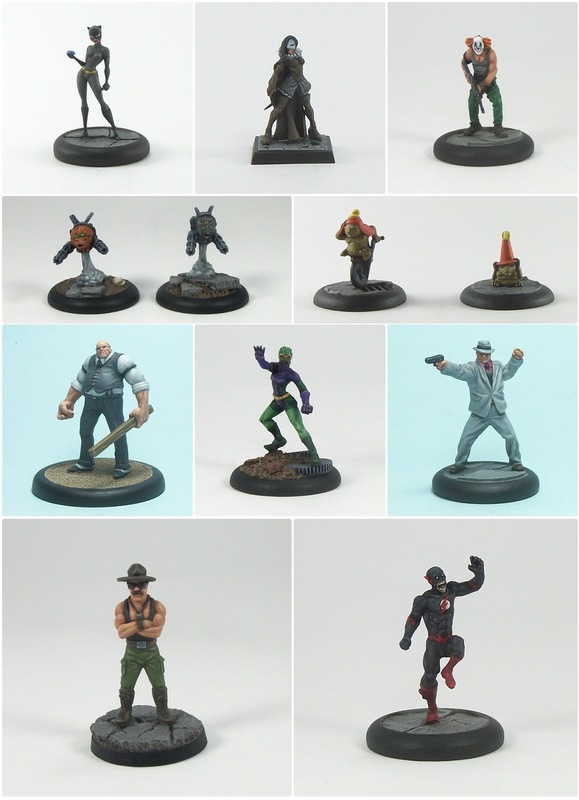 Comedian is my 27th painted BMG mini this year, and take me to 58 painted characters for the game. At the current rate of release I will always struggle to keep pace, but it is such a favourite IP of mine that I will continue to collect them! I have yet to use the Watchmen, but on considering stats alone Comedian looks like one of its most important fighters, with a mix of ranged and close combat Traits. I think I will need quite a few games to get a feel for them, and against as wide a variety of opposing crew styles as possible. Comedian looks pretty tough with End 9 and Hardened, but only Def 3; he seems something of a jack of all trades without mastering a a particular aspect. Consequently, I am going to have to learn how durable he really is and how best to use him. 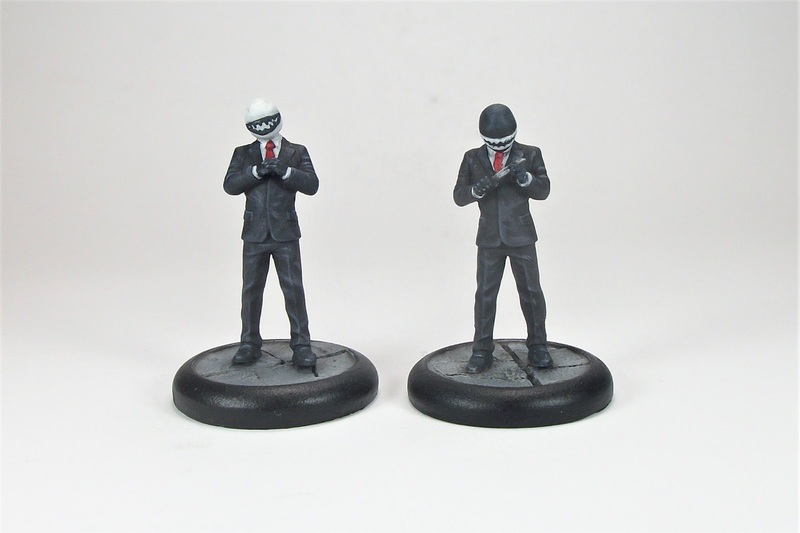 I have been painting the Watchmen on and off (mainly off....) for almost two and half years now, so getting them cleared will be long overdue. The irony is that I suspect they have fallen behind the pack as the BMG game overall has progressed, so I guess they will be challenging to use. If they become my main crew for next year I reckon I will face a lot of losses along the way - although I am vacillating between Watchmen, Joker, Mr. Freeze and a weird-ish Organized Crime list. In game terms Silk Spectre seems a cheap defensively-focused character (she has high Defense, Acrobat providing Dodge, Martial Artist and Counterattack), and although she puts out a lot of Attacks, that won't lead to a lot of Damage so she may even struggle taking out some Henchmen, Essentially I see her sitting on an Objective (preferably Ammo or Titan for the Ping rolls). The Thing is added to the 'done' list! Although I had not really planned on painting any more MUMG in 2016, when I bought the The Thing I assembled him pretty quickly in readiness for possible painting. My thinking was that with a simple colour scheme, he would be quite quick to do despite his large surface area (he is 65mm from the bottom of his base to the top of his head!). Then I found myself focusing on other stuff. When I decided it was time to tackle the mini, the painting stages were: an orange-brown base layer; Devlan Mud wash (with some extra spot washes of AP Soft Tone); dry-brush the same brown; dry brush a lighter brown; then pick out top edges of 'rocks' with successively lighter highlights (4 passes on the highlights). Finishing The Thing gives me 17 Levels of Superhuman Heroes (with Black Widow and Black Panther), or 16 Levels of Cosmic Heroes (with Groot). I am most likely to play an Avengers style team I think so will be mostly adding to the Superhumans as things progress next year. These Spider Robots are my first painted minis for the Spider-man Miniatures Game (SMG) from Knight Models, companion game to BMG (albeit with many caveats). Theoretically SMG and BMG are compatible, but time will tell (as will those caveats I mentioned). These are not the most interesting of minis, but I set out to get something painted very quickly and these fit the bill! I tackled them as a 'speed painting' exercise which is something antithetical to my usual plodding approach, so that too was satisfying. 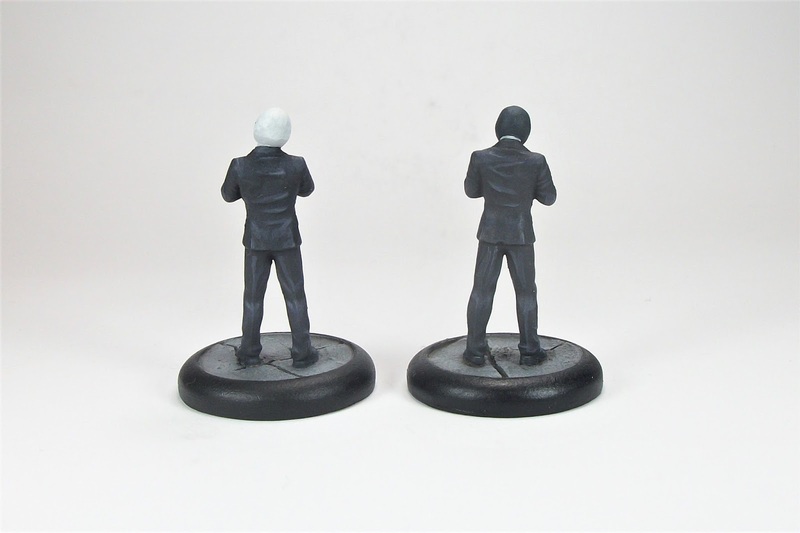 Either way, I have started on yet another range (albeit one limited to 15 minis at present). It will be a while before I get an SMG crew together, and it may require house-ruling allowable inclusions due to the dearth of options (especially for the Goblin Cult which I want to play first); right now, assuming 500 Rep increments, Goblin Cult could be played at 200, 250, 350 or 400 Rep, but not 300, and at 350 Rep (typical for BMG tournaments I have been to) the crew has only two models. Right now with no new releases in 11 months SMG seems dead in the water, but they have updated the rules document for it recently so who knows if there will be more SMG models (as opposed to ports from MUMG)? Well Knight Models do, but of course they are not saying either way. The 'Grin Twins' (as Knight seemingly call them) are taken from the recent Suicide Squad movie where they were briefly seen as part of Joker's gang. Like other Joker Henchmen from the film, they are considered Elite: Cosplayers, meaning only Jared Leto Joker can take more than one of them. I have recently struggled for painting motivation, so with a simple colour scheme, the Grins fit the bill for something to paint to get a quick turnaround. Painting two at the same time obviously sped things up, and I was able to finish them by painting for 20 or 30 minutes here and there over a few days. Although I am planning a Joker crew, I am not planning on using the Grins anytime soon, but if I change my mind at least they will be ready. Painting these two BMG minis takes me past 60 minis for the year which is pretty satisfying, and I hope to match or exceed last year's 63 in total. My usual quarterly summary is almost a month late - shows how much I have been preoccupied with not feeling the painting mojo! The funny thing is that it is my best quarterly output in almost 4 years of monitoring what I paint! Between July to September I painted 21 minis across 5 ranges, so hopefully living up to the 'eclectic' title, even if only a little. One of those ranges was my first toe-dipping into Knight Models' Marvel range (MUMG). which I hope to add to in the next few months (I am far from a playable team for the game yet). I am especially pleased to have painted a fair few Pulp City models in the quarter, taking me way beyond my original target for the range this year. In all, despite my feeling of painting malaise at times, on reflection it was actually a pretty productive period hobby wise. 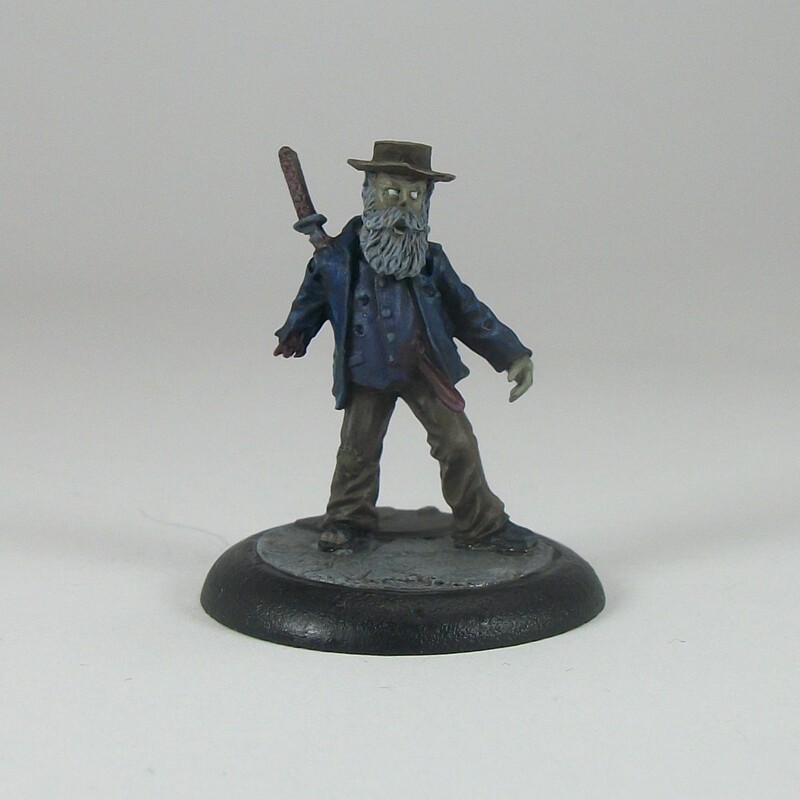 Another Zombie painted, and I have managed to meet this year's Zomtober quota despite struggling with painting motivation for the last few weeks. 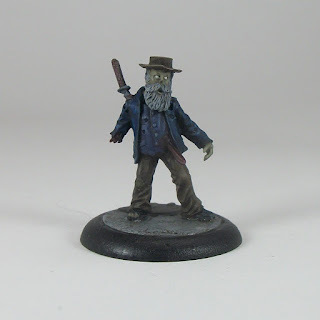 I actually started another mini as I thought I was not going to manage this one, but then suddenly this weekend momentum caught and he got there in the end (leaving me with another part-painted Mutant Zombie - LOL!). 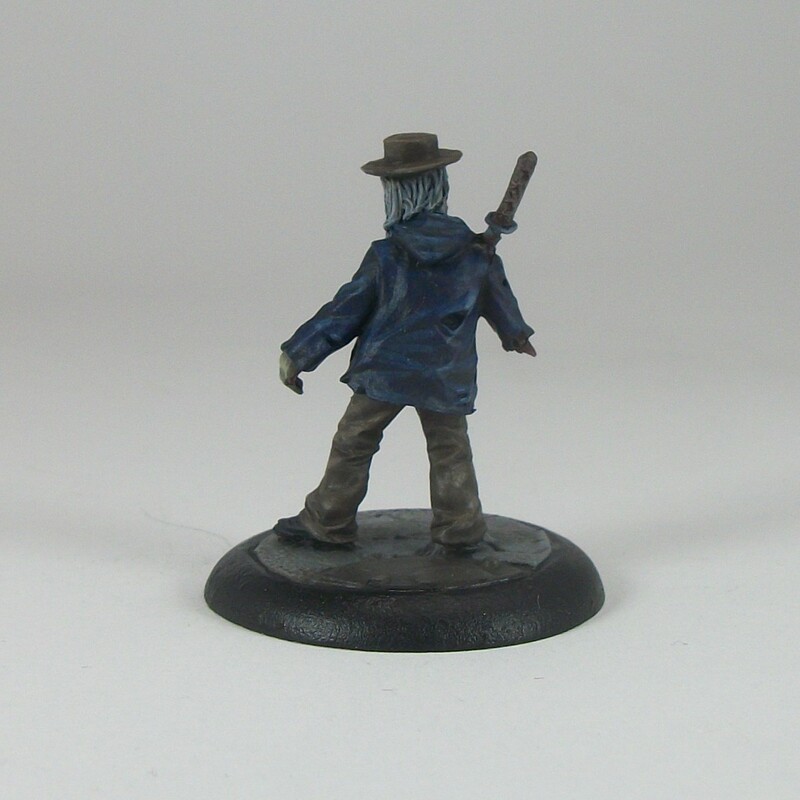 This mini was prepared years ago, as evidenced by his black undercoat, but he never got further than undercoating unlike some of the other minis I finished off for this year's Zomtober. 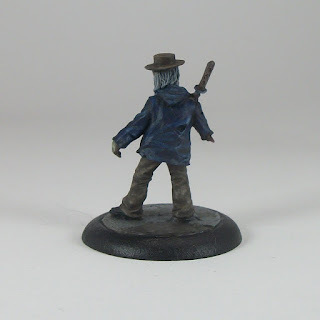 The mini is one of the many Studio Miniatures Zombies that I have in my 'lead mountain' (enough to keep me going for a lot of Zomtobers to come to be honest!). 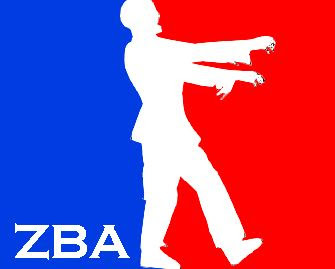 I like the fact that the Zombie is shuffling around with a katana embedded through his torso! Makes you wonder what happened to his attacker! In previous years Zomtober has spurred on other painting, but not this time. However, I met my target which is the most important thing, and the horde has grown a little more which is always positive. 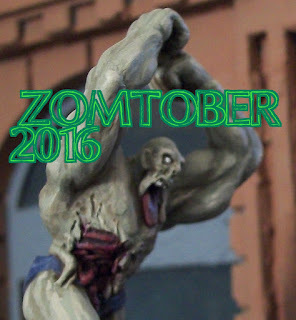 Finally, once again I have to say it has been brilliant to see so many participants involved in Zomtober 2016 each week, and I hope to see as many of the bloggers who have been involved this year striving to do so again next year. Well done guys! Another Zombie done, and another of the long-gestating backlog paint-jobs finally taken out of the painting queue. This one was started a few years ago and abandoned, despite being a totally ace mini and a brilliant nod to Shaun of the Dead. It was undercoated black and I had blocked out some colours before it sat for a few years unpainted. With my primary focus this year on clearing the queue, I kept putting this one off, and it took a bit of work on it for me to start to feel as though it would get finished. Well it is now, which is a bit of a relief! The mini is from Hasslefree, and I think it is such a great sculpt. I *think* there is a Survivor version as well. While painting this, I tried to get an effect I'd be happy with to represent the blood that would have poured down the front of shirt from his torn throat, and I am reasonably happy with it on balance. This isn't the mini I planned to do for this week's entry, but as I am still feeling only limited motivation for painting in general, I knew I didn't have enough time to finish the intended mini. Instead I set about doing some speed painting to clear this from the lead mountain, and thankfully got a quick win. That said, I did splash a little bit of acrylic paint on the next two weeks' minis too, so hopefully the final two for Zomtober 2016 will be less of a rush! It is really cool to see other bloggers' posting their Zomtober stuff, following what started as a throwaway discussion a few years ago. Personally being involved helps me get focused on finishing minis, so I foresee myself Zomtobering for years to come! Week 2 and again it has been great to see other bloggers finishing their entries for Zomtober. I am just about still on target, although this entry is a bit scrappy in the painting to say the least. 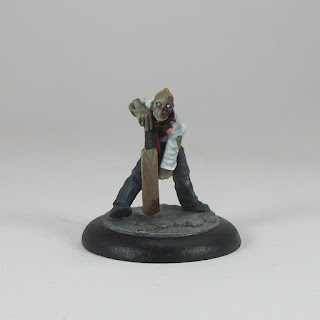 Like my Week 1 Zombie, this mini has sat unfinished for a long time (it had some dead flesh painted and that was it). Part of the problem was the consistency of the green I used as a base coat - I didn't mix the paint well enough and it made a horrible shiny and thick base coat, which I didn't really recover from. That aside, it is finished which suits me. A bit of a shame as it is a really nice sculpt, but being 'done' is key for me. I am still struggling for painting motivation, so the annual commitment of Zomtober is helping to ensure I don't stop entirely. There is stuff I'd like to have painted, I just don't really feel like painting unfortunately. I am hoping something 'clicks' soon. Next week's planned mini is also one that has sat unfinished for far too long, so another bonus for me from Zomtober this year is clearing the backlog of stuff that really should have been completed years ago. Zomtober 2016 is underway! Already the dead are walking into blog posts while beleaguered Survivors arrive to turn back the Zombie tide. Well done everyone who is taking part, with a lot of familiar names - great stuff guys. 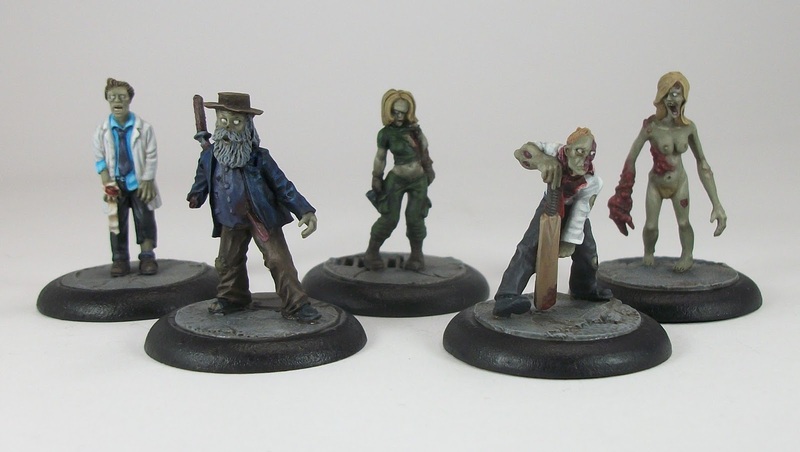 This year my own personal project is to finish off any part-painted Zombies that I have lingering in the painting queue. And to start that, this mini was commenced at least a couple of years ago I think, and even had some work done last Zomtober before being abandoned once again. Well, thankfully it is finished now! (Although on the way to that this weekend I have grappled with computer issues - losing Picture Manager is a blow - as well as picking up a bit of a cold bug). 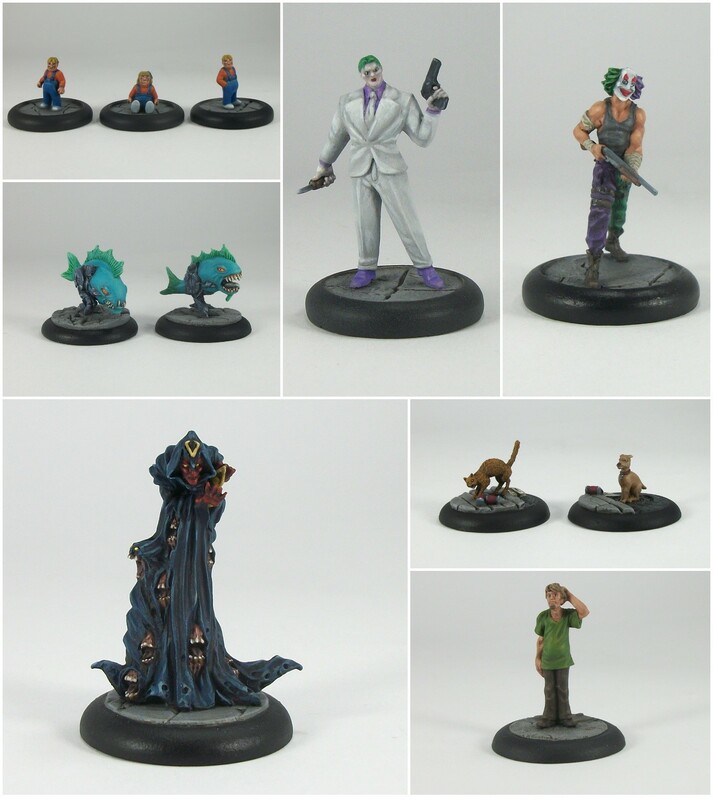 The mini is from Hasslefree, but not sculpted by Kev White. Not sure why I kept abandoning the painting, but that just happens to me sometimes. Anyhoo, the annual paintathon of Zomtober provided sufficient motivation to get this one cleared. The painting is a little rough in places, but it counts as finished which is the main thing for me. Grr - sometimes I hate painting stuff, I really do. I paint to play (I don't like the sight of bare minis in games, so painting is very much a necessary evil for me), and sometimes I find it really arduous. That was the case with these Robotic Dolls. Unfortunately the detailing was soft, and did not replicate the level of detail depth visible on the Knight Models studio versions (which were presumably resin casts; as an example, folds are visible on the studio minis which were not apparent on these metal casts). Well, regardless, they are now done; they could be better, but I am moving on from them - they will pass muster and are good enough for the table. The Robotic Dolls are creations working for the Joker in the Dark Knight Returns story-line (the same one which included the Sons of Batman), and I think the minis are pretty faithful representations, although I would have preferred crisper casts from the masters. In game terms they are pretty much one-shot flying bombs, because with Defense 2 and End 3 or 4 they won't last long if attacked. Until I give them a go on the table I am not sure how useful they are since they are unlike any other characters available right now in terms of rules. Although they have Laughing Gas attacks, using them precludes their self-detonation in the same Activation, giving your opponent opportunities to take out a Robotic Doll unless you feel confident of Activating it late in a round, then winning the Take the Lead draw to go first in the following Activation. Bobbie Mk II (far right, hands in pockets) seems the most effective of the three, and both his Attacks will affect a cluster of enemy models. 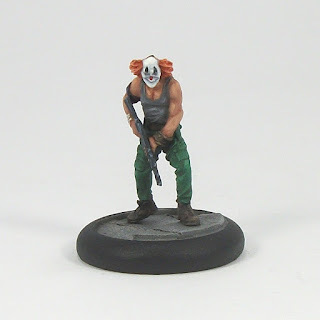 Finishing these takes me to seven Joker Henchmen, at over 165 Reputation, so I really should paint a Joker soon to consider actually playing them! In addition, I have moved past the milestone of 50 painted BMG minis with these three, so I *may* do a big 'everything so far' group shot soon to celebrate. Wolsey is a Hasslefree Miniatures model, and I am sure any resemblance to Norville 'Shaggy' Rogers is entirely coincidental! I have started a concerted effort this month to get non-combatant civilians painted for modern-day gaming, and so there will be something of a theme here and on the Pulp Citizen blog around that. With relatively few colours to paint, Wolsey seemed a perfect choice for me to get some momentum. 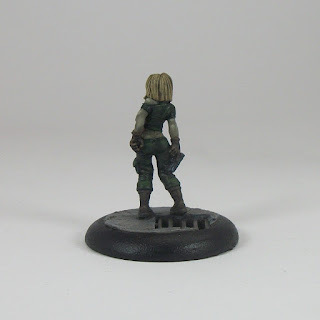 The sculpting is to Kev White's always exemplary standards and it was a really nice mini to paint. I had undercoated and prepped this one a long time ago - it was undercoated black which is something I haven't done for several years. So knowing it has taken me a long time to get this mini done gives me an extra sense of satisfaction. 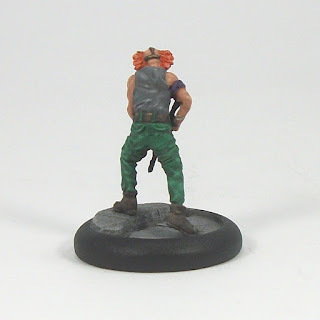 I'd like to get at least seven or eight civilian typs painted this month, and have three in the bag already, so that feels do-able, but time will tell. I may intersperse some other painting while i am at it if I can summon enough focus. 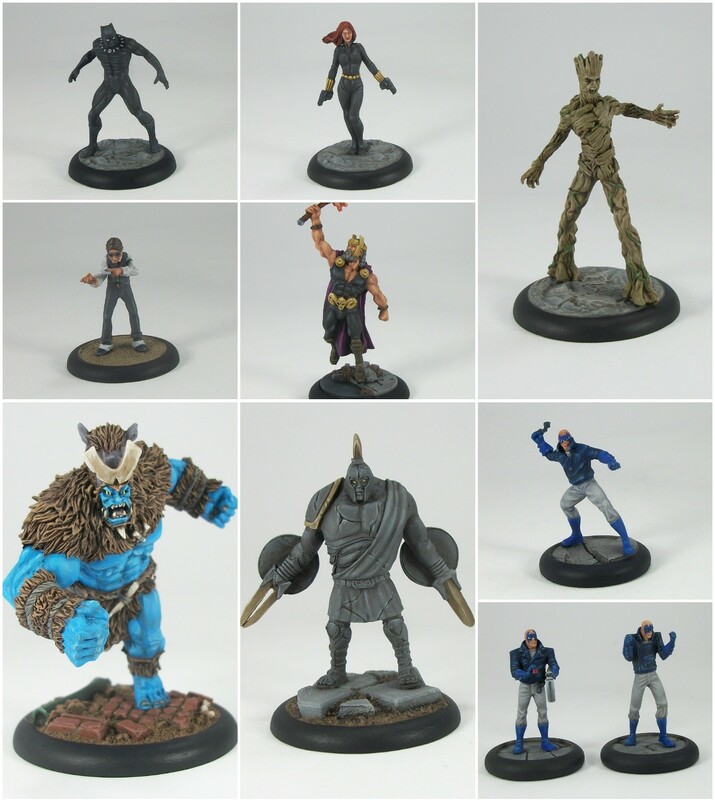 XTRAIDOS - Yin Yang Assassins is a new crowd funding campaign to add some additional minis to the Xtraidos range, and being run on the IndieGoGo platform. I love the sculpting for this small range, so I felt I had to back it. I have the first few releases and I am looking forward to adding more to those. Commenced alongside Son of Batman 01, I held back finishing these two minis until I had a clear colour scheme from tackling the first one. My main drivers for painting them were wanting to (hopefully!) do a Batman crew without Cops, and also to get some 'quick wins' in the painting queue in July both of which the three Sons of Batman satisfied. Some former members of the Mutants gang in The Dark Knight Returns became vigilantes inspired by the return to the public eye of an older Batman. In terms of style, these are very close to what was depicted in the original comic book. In terms of game play I have yet to use a Batman crew, but I think Son of Batman 02 (with the Shotgun) will be a fairly close substitute for Agent Ron, in Reputation and Funding costs. Son of Batman 03 on the other hand, is a trickier decision. In effect at 39 Reputation he is roughly equivalent to two Cops, meaning one less model in a hypothetical crew. At Defense 4 and Endurance 6 with Hardened and counterattack he seems very much set up for tanking an Objective, which makes his Follow Me Trait somewhat redundant. As a consequence I have my doubts about using Son of Batman 03 despite his very good aspects. 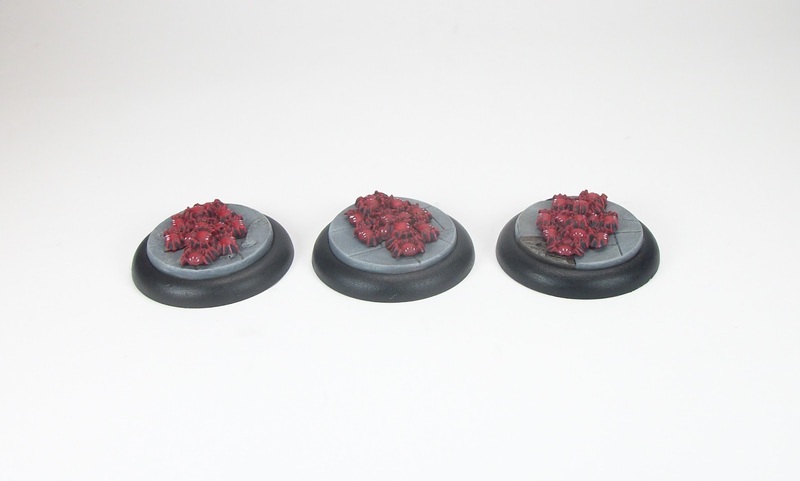 Not sure what I will paint for BMG next, or when I will next paint something from the range as this month I have managed to paint stuff for three other ranges which has been nice. That probably means I will end up being BMG-centric next month without realising it! More importantly, this takes me to 10 painted minis for the month overall, which is pleasing and gets me back on course for my annual target. In addition, these are the 48th and 49th BMG minis for, so the next one will be something of a milestone. Son of Batman 01 is the first BMG mini I have finished in seven weeks, mainly due to a big painting slow-down in June, and also a conscious effort to get stuff done for other ranges. That said, I plan to finish the other Sons of Batman in the next few days, so more BMG will be on the horizon. I painted this one first to quickly test out how I wanted to tackle the colours, so it is very probable that the other two will be tackled as a pair. Unfortunately the pictures make the eyes look a little wonky; I don't feel they are as misaligned up close. Not a great paint job, but it will do. The Sons of Batman are Henchmen options for Batman crews naturally, and were featured in the Dark Knight Returns comic from the mid 80's. They started out as members of the Mutants gang in that story, and with the Batman's return, some became vigilantes inspired by the legendary hero. In game terms they are additional Henchmen choices, and give an alternative to the various Cops. This one is very cheap at 14 Reputation and $100, and seems ideal for sitting back and guarding/contesting an enemy Objective, likely equipped with a Whistle. If I put a Batman crew together at some point, I can imagine using at least two of the Sons of Batman, but possibly not all three since I feel the Reputation cost for one is too high for what he does. 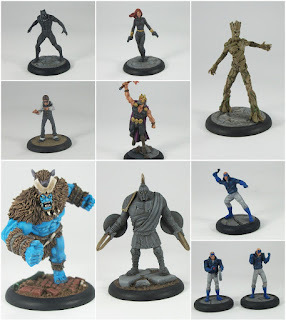 Black Panther is the third MUMG mini I have painted in the past couple of weeks, and will probably be the last one for a while from me, as I start to refocus on other lines. Black Panther is one of my favourite Avengers (he would make my ideal 'best seven' lineup without doubt), so being able to get a quick win in the painting was a real bonus. Reading a run of Avengers comic books from the late 1960's when I was a teen (thanks Peter Atkins!) is what made me like the character, and I continued have ever since. Frequent positioned as ruler of the (fictional) African nation of Wakanda, T'Challa also bears the mantle of the Black Panther, having earned his right to the honourable name and trappings. I loved his inclusion in Captain America: Civil War, so as soon as I saw the mini (which I think is an excellent sculpt, and was very cleanly cast which was very welcome), I knew it would be one of the first MUMG characters I would paint. The painting used my standard approach to not-black black, and the biggest struggle was trying to pick out the eye-piece lenses. I wish all minis and painting offered quick wins like this! Alas not! If and when I start playing MUMG, I think Avengers/good guy superhumans will be the team i try, so will be built around Black Panther and Black Widow and building from there. If the 'standard' game size for MUMG is 50 levels, then to match that I think I am looking at something like another four or five minis to paint up. Black Widow was another quick paint job after recently completing Groot, but in my more usual approach. I started this one, like Groot, as a way of getting a 'quick win' of getting something done after June's slowdown, and was surprised just how swiftly (for me, anyway) I was able to get the main work done. 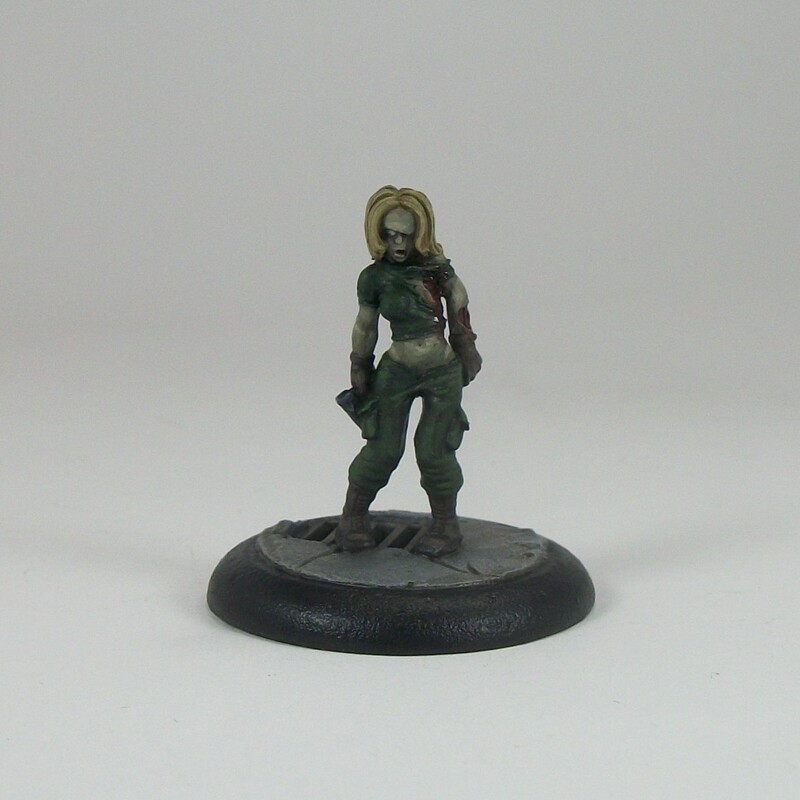 I found it a very nice model to paint, probably because of the quick turnaround as well as the subject matter. That said, I do need to soften the shading around the face so it doesn't look so heavy, which I only spotted after taking the picture! The mini was an earlier Knight Models Marvel release and has been superseded by a different pose sculpt, both with same costume and trappings. Not sure whether she can be used in official Knight tournaments based on their proxy restrictions in BMG, but time will tell! After painting so many (not-quite-black) black costumes lately, this was really straightforward, especially as she has four main colours. I opted for painting her hands as gloved rather than bare, since it just seems more logical she should have them. 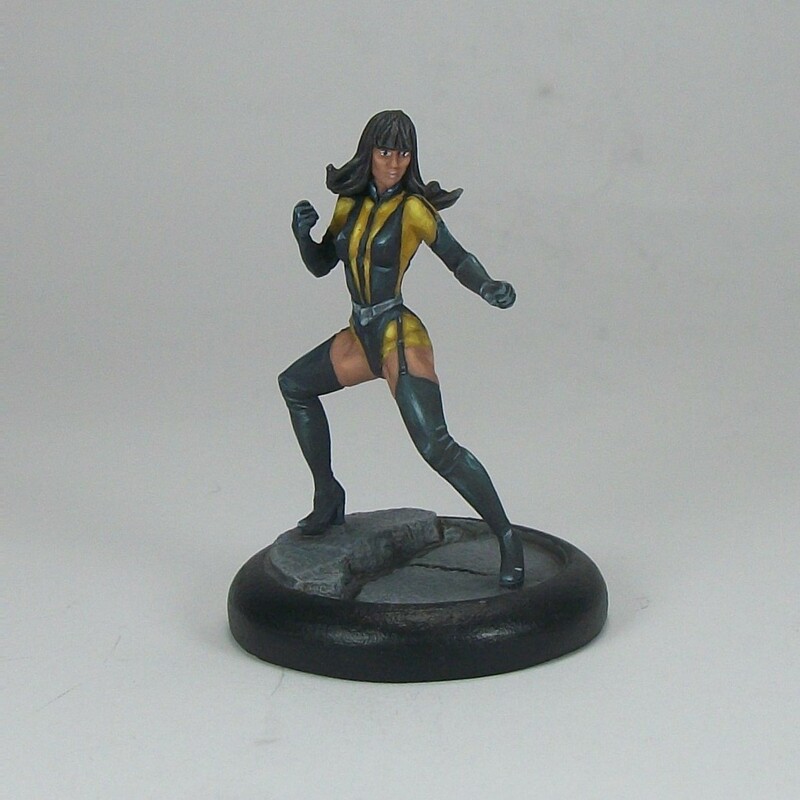 While tackling Widow, I have made a small start on her team-mate Black Panther who I hope is another quick win. After that, I don't plan to tackle another MUMG mini for a while as I want to get into some backlogs for Pulp City, GI Joe and BMG, and finally start some Dropzone Commander painting. Groot is the first MUMG mini I have painted, and something I tackled as I felt I could finish it pretty quickly, once I decided to use a similar approach to the one I used for Father Oak for my own Pulp City collection (click for link). The technique involved painting a grey-brown base coat, and then two lighter quick dry brush coats, with some olive green dry brushed to bark edges. This was followed by painting some but not all vines olive green. Then I applied a very thinned down wash of Gryphonne Sepia, followed by Soft Tone, then Devlan Mud. Finally I picked out some edge highlights with VMC Stone Grey, and painted the eyes and mouth. All told, maybe an hour and a half over 3 sittings. It is no award winner, and maybe a little lighter in colour than is preferable, but I am happy with how it turned out, especially to get it finished so quickly with recently losing my painting momentum. I really enjoyed the Guardians of the Galaxy movie, but have no desire to tackle them for MUMG in the near future as a faction since a couple of sculpts leave me a little cold. They are not bad, I am just not grabbed by them. However, I do foresee me getting to grips with Avengers as I love the team and prefer their sculpts, which is my way of saying that Groot won't be joined by other GotG minis any time soon! 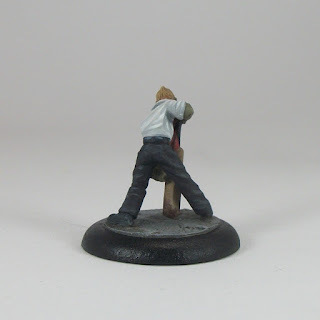 Mr. Tannen is the second Malifaux mini I have finished (after Mr. Graves back in April). I started Tannen at the same time as Graves, but then he fell by the wayside as I finished off a few other bits and pieces. I struggled with bits of the mini as it is designed in a hunched over pose which is nice, but awkward at the same time. Not the hardest or most intricate of models, but for me for some reason not the easiest. Still, I do think the Malifaux plastics are nice kits and cannot fault the first two I have tackled. I still know very little about the various characters in the game (I keep meaning to pick up the rule-books other than the small Rules Manual I have), but I know the two i have painted so far can work together, and I feel that visually Tannen and Graves fit neatly with one another. On the painting horizon next I think will be some G.I. Joe minis, some Pulp City, and maybe finishing some BMG odds and ends. And on top of those, I do really need to make a start on my Dropzone Commander force.Hopefully I will recover some momentum sooner than later, so watch this space. Sniggering is done, but he is far from a favourite mini, on that more in a bit. The model is the third Henchman addition to my planned eventual Joker crew, and it is pleasing to have regained some momentum this month as this is the fifth mini I have completed across three ranges. Sniggering has the always threatening 'Automatic Rifle', easily one of the best weapons in the game and one that is well worth its cost as it can create a sense of threat for most characters. In the tournaments I have attended, I rarely see any crew leave out their automatic rifle option if they have one. It seemed sensible to make sure Sniggering made it into the list. End 5 and Willpower 5 gives him a decent opportunity to ensure he can use his weapon even if attacked, while retaining mobility or capacity to reload from Ammo. On to the mini. Not my favourite as I said. The casting was rough as heck in places as can be seen from the poorly cast wrist bands if you look closely. Parts were also a bad fit, which may be partly due to some of them serving for different models. And because of the design, some places were really hard to reach with a brush, which only became apparent as I progressed. I started painting Sniggering at the same time as August, and he got abandoned part way through as I concentrated on other stuff, but in the past few days I resolved to thin down the backlog of part-painted minis and this became a prime target. the current list I am thinking of taking is: Joker (Arkham City); Hush (for Take the Lead and Strategy shenanigans); Victor Zsasz; Sniggering; August; Contra-Auguste; and Six (the tournament Joker Henchman card). To make that up would take three more minis which isn't too much, so could be done this year.